Welcome to Ramsgate Harbour! We are located at the very west end of Front Beach Road adjacent to Carillon Beach. Ramgate Harbour is a three story, 66 unit complex, with 550 feet of the World’s Most Beautiful Beach right off your balcony. The only thing between you and the white sand and emerald gulf water is the Ramsgate pool area which offers a grilling area with picnic tables, outdoor showers, and restroom facilities. Ramsgate Harbour is ideally located away from the high rise condos and Spring Break crowd; but close to some of Florida’s finest restaurants, shopping, and other entertainment options. Bayou Bill’s is right across the street or head east down the beach and try Boars Head, Pineapple Willey’s, Captain Anderson’s or Pier 77 (best raw oysters on the beach). Go West toward Seaside to the Beaches of South Walton (Highway 30A) and choose from Shades, Terrace Restaurant, Bud and Alleys, or The Red Bar. For your shopping pleasure, the Silver Sands Outlet Mall is less than a 25 minute drive in San Destin. Pier Park, less than 10 minutes away, offers Dillards, Target, JC Penney, numerous other shops and restaurants, and movie theater. For a taste of “Old Florida”, you have to try Dusty's, Thomas Donuts (line forms early), or Sunnyside Grill. For the kids, don’t miss Shipwreck Island Water Park or Zooworld. For your convenience, Publix, Winn Dixie, and CVS are within walking distance. Now that you are sold on Ramsgate Harbour, let us tell you why you should select our Unit #60. First of all, we have installed an electronic entry system which means that you won’t have pick up your key upon arrival or worry about losing your key or getting locked out. Unit #60 is a townhome layout with the common areas, including the laundry and a half bath, on the first floor and 2 bedrooms and 2 baths upstairs. Both levels have new wood floors with tile bathrooms. The kitchen is fully equipped with upgraded appliances including smooth top range, built in microwave, and all you will need for cooking. Our unit is beautifully decorated with 3 flat screen high def TV’s, a king size bed in the master bedroom, queen size in the guest bedroom, and a queen size sofa sleeper. We also offer WiFi, an expanded cable package with HBO and Showtime, and Netflix (includes Netflix for Kids). What sets our unit apart from other units? Unit #60 is one of the few corner units in Ramsgate Harbour; therefore, we have an extra western facing window that offers amazing views of the sunsets from the living area. Also, we are located close to the pool, so you are just steps away from the grilling area. Step out on either the downstairs or upstairs balcony and watch the kids enjoy the pool or the surf. Covered parking is conveniently located beneath the unit so you stay dry when it is raining. Also, we are pleased to offer an extra discount for our military personnel (active or retired). For all you do for us, we want to show our appreciation. All that we ask is that once you have stayed in Unit #60, please let us know anything that we can do to make your stay more enjoyable. We want to see you again! (Please note that during Spring Break or the peak Summer times, a one week stay, Saturday to Saturday, is requested). Beautiful view of the Gulf and Pool from both balconies. Front load washer and dryer. Detergent is furnished. You must pick up a parking permit at the office. We try to also keep some in the condo. Put your unit and dates of stay on the permit and leave in the vehicle. Comercial quality aluminum foil and plastic wrap furnished. Newly remodeled with Granite counter tops and solid wood cabinets. Ample recessed lighting. High def TVs in Living area and bedrooms. Netflix and Netflix for children furnished. 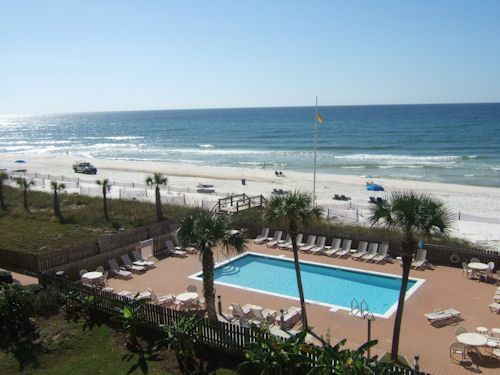 Condo is in a great location in PCB and in a great location at Ramsgate. When you walk out of the unit you are right at the pool and right at the beach access. We were very happy with our stay and Dennis was very easy to work with. My only reason for 4 stars instead of 5 was the condo is in need of a deep clean and a refresh. All linens, beds, bathrooms, kitchen were clean, but we noticed quite a bit of dust build up on the blinds/curtains, and behind TV stand and under beds and other furniture. I probably would not have noticed, but with little kids, I was always searching for lost toys and dropped items under the beds and couches. Noticed some paint peeling on the stair railing and some dirt build up on some areas that probably just needed a little extra scrubbing. Other than those few items the condo was great and we would stay there again. What a great week! Quiet, convenient, and the most beautiful views of the beach. Lovely updated condo. We hope to stay again many times in the future. Thanks so much! Very comfortable, well maintained with excellent beach access. We enjoyed our stay, the unit is well maintained, with beautiful views of the gulf from two outdoor decks. Located in a quiet yet convenient area of PCB. Easy beach access and nice pool area. Well equipped condo with everything you need in the kitchen. Only bad part was climbing three flights of stairs. Turn around day for weekly rentals is Saturday. Half of remaining payment due 30 days and the balance 15 days before arrival. Payments are refundable if cancelled 30 days before arrival. We try to work with guests on refunds if problems arise.